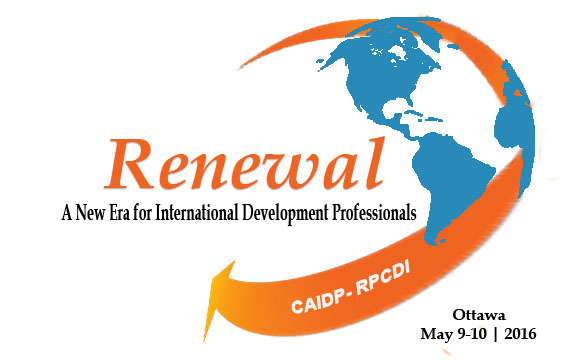 The Board of the Canadian Association of International Development Professionals (CAIDP) would like to extend its deepest thanks to all Sponsors of the CAIDP Conference for their continued support. The CAIDP 2016 conference could not succeed without your generous donations. Each sponsorship plays a vital role in ensuring the success of the event. Your support is vital in easing the inevitable high costs that are involved in organizing an event of this magnitude and demonstrates the strong commitment of the Canadian international development community to the conference, to promoting interest in international development, and to the work that CAIDP undertake on behalf of our community. The CAIDP Board wishes to express particularly thanks to its members which sponsored this year's conference and which are listed below. Founded in 1986, Agriteam Canada Consulting Ltd. has implemented more than 350 projects and assignments in Africa, Asia, the Middle East and Eastern Europe, as well as North, South and Latin America and the Caribbean. Our expertise lies in agriculture and food security; education and education reform; governance and public sector reform; health; legal and judicial reform; monitoring and evaluation; environment and natural resources management; private sector development; and gender equality. Agriteam’s clients include Global Affairs Canada, the World Bank, various UN agencies and other donors and private sector companies. Agriteam has head offices in Calgary and Gatineau, and field offices in Honduras, Colombia, Peru, Ethiopia, Mali, Tanzania, South Sudan, Mongolia, Vietnam and Ukraine. Cowater International (Cowater) is Canada’s leading management consulting firm focused on providing services to developing and emerging economies. Since 1985, Cowater has provided leading-edge, innovative solutions to more than 65 countries worldwide. During this time, Cowater has completed more than 400 projects and has developed a reputation of excellence for our strong ability to work with clients and stakeholders to provide solutions and services tailored to the needs and challenges faced by developing and transitional countries. Julian Murray is a senior consultant specialising in strategic planning, programme design, performance management and evaluation - in both international development and humanitarian assistance. His consulting clients include UN agencies, regional organisations, bilateral donors, universities and international NGOs. He has over 35 years’ experience with the Canadian International Development Agency (Global Affairs Canada) and UNHCR, and has worked extensively in Africa and Asia. Burnside Burnside is a multi-disciplinary engineering and environmental consulting firm in business for over 45 years. The firm has been working internationally for over 20 years on projects funded by the World Bank (IDA, IBRD, IFC), Millennium Challenge Corporation, African Development Bank, Caribbean Development Bank, Inter-American Development Bank, UNDP and GAC (formerly DFATD/CIDA). Burnside currently has over 330 full-time staff. Capra International Inc. was incorporated in Ontario, Canada, in April 1987 and is based in Ottawa. The company offers multilingual worldwide business and development consulting services involving capacity building, evaluation and performance measurement. The company’s services now reach 194 countries. Capra’s work is supported by a large global network of associate consultants. World University Service of Canada (WUSC) is a Canadian organization in international development, committed to building a more equitable and sustainable world. WUSC works with a unique and powerful network of post-secondary institutions, private-sector partners and volunteers to provide education, employment and empowerment opportunities that improve the lives of millions of youth, women, and other marginalized populations in 20 countries worldwide. The lawyers at Hazlo Law practice exclusively in the areas of Business, Tax and International Law. The breadth and depth of this group’s experience and geographic coverage ensures our clients always have access to the full scope of relevant expertise required to advance their business goals. Our International Law Group regularly advises international companies, charities and non-profit organizations on a wide variety of matters including international contracts, enforcement of foreign judgements and strategic affairs. E.T. Jackson and Associates Ltd. is an award-winning international management-consulting firm. Headquartered in Ottawa and Canadian-owned, the firm specializes in strategic planning, organizational learning and performance assessment, advising foundations, development agencies, non-profits and universities in Africa, Asia and the Caribbean. The company's recent assignments have focused on impact investing, youth employment, governance programming, and civil society development. Integrated Development Enterprise Associates (IDEA) is an Ottawa-based international development management consultancy firm, specializing in the provision of technical assistance and training and supporting Canadian and International Organizations. IDEA focuses on improving the efficiency and effectiveness of international development programs and projects through the delivery of strategic technical assistance, training, project design, iterative project management and performance measurement practices. IDEA has a track record of success working with some of Canada’s largest educational institutions, municipalities and provincial institutions, the private sector firms, International Financial Institutions (IFIs), such as the World Bank, and UN organizations, including UNESCO, UNDP and UNRWA. Bow Valley College is the largest community college in Calgary, Alberta, Canada, and Calgary’s only comprehensive community college, with main campuses in downtown Calgary and regional sites in 20 locations throughout Southern Alberta. Established in 1965, BVC serves approximately 15,000 students annually from over 140 countries, including 5,000 online learners, and BVC assists over 20,000 people annually to review and build career opportunities that set a path to live a better life. With over 50 years of technical and vocational education experience and 30 years of international partnership collaboration in more than 20 countries, BVC has a strong history of successful overseas development and training projects focussed on the concept of community driven capacity building. The Hill Times is Canada’s politics and government newspaper. Published every Monday and Wednesday, The Hill Times is a must read for Members of Parliament, Senior Public Servants, the Diplomatic community and key decision makers.